2016 Availability Calendar! 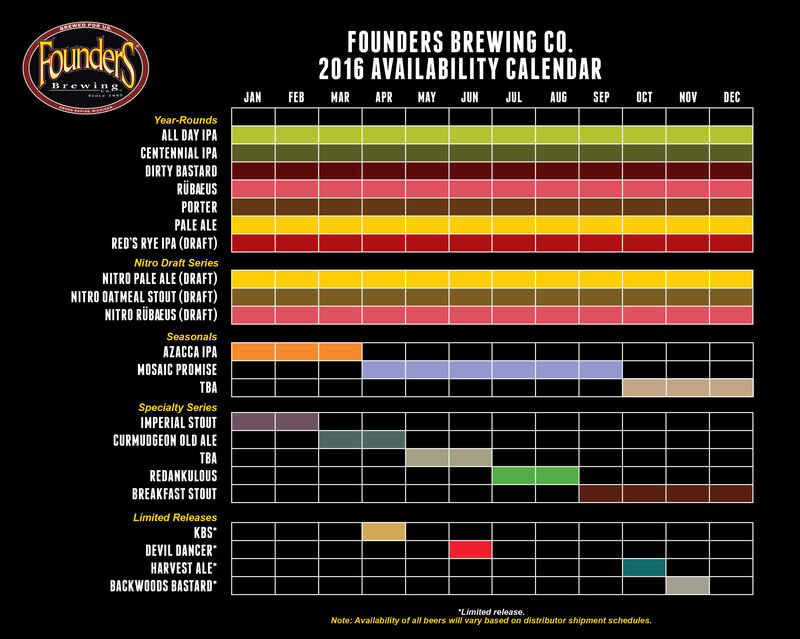 - Founders Brewing Co.
Posted on December 17, 2015 by Founders Brewing Co.
Rubaeus is now a year-round offering! Azacca IPA has taken the place of Black Rye as our first seasonal offering of 2016. Mosaic Promise also joins our seasonal line-up. reDANKulous will be available in 4-packs from July-August as it is now part of the specialty series! Breakfast Stout has transitioned from a seasonal offering to a specialty. Congratulations, Breakfast Stout! We now offer three year-round offerings in our nitro draft series: Nitro Pale Ale, Nitro Rubaeus and Nitro Oatmeal Stout. Along with our 750mL Backstage releases, we will have a new seasonal and a new specialty to announce. Stay tuned! Now go forth and plan the rest of your year! « Announcing Southern California Distribution! No Double Trouble!?!? Maybe We’ll see Sumatra Mountain brown as the TBA seasonal? Or, even better… Frangelic Stout!?!? No Double Trouble this year, unfortunately. That doesn’t mean we won’t bottle it again though! We benched Dark Penance for now but that doesn’t mean it won’t make an appearance again in the future! Do you keg Rubaeus for consumer purchase? We do! Contact your local retailer to check on availability. What does breakfast stout’s move to specialty mean? Our seasonals will all be offered in 6-packs this year, so we transitioned Breakfast Stout to the specialty series because it will continue to be offered in 4-packs. Not to fret, the pricing and availability will remain the same! It was just a category/consistency thing. Nothing in life is ever certain, is it? Wonderful news about Mosaic Promise!!! Let the rest of the country discover how great it is. Thanks Brian! It is too good not to share with everyone else. Where is Double Face on your release schedule? No Double Trouble this year, but that doesn’t necessarily mean we won’t bottle it again in the future! Will Rye Death be available in bottles? Not this year, but we never say never when it comes to the future!